To Hannah Arendt, political theorist. From David Orr. Reading about your life and reading your political theory, I feel like I know you. When I read your work I feel your strength, your commitment and your intelligence coming through the pages. 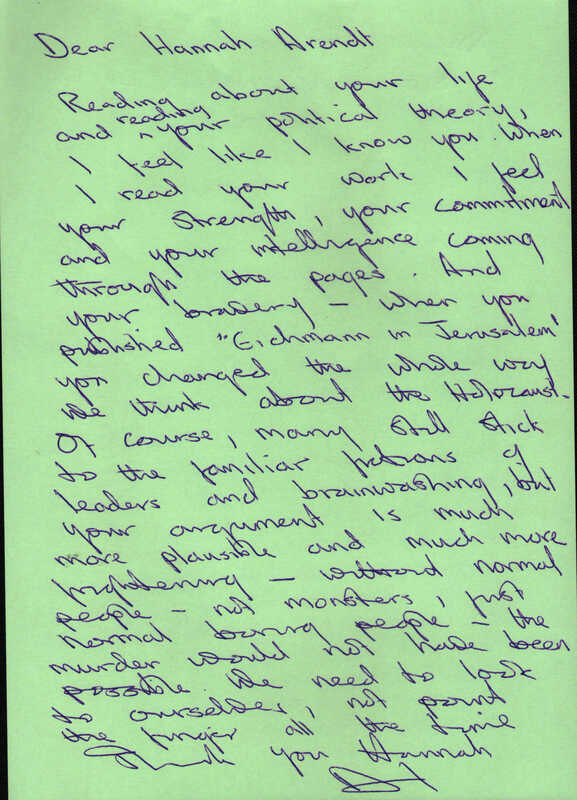 And your bravery – when you published “Eichmann in Jerusalem” you changed the whole way we think about the Holocaust. Of course, many still stick to the familiar fictions of leaders and brainwashing, but your argument is much more plausible and much more frightening – without normal people - not monsters, just normal boring people – the murder would not have been possible. We need to look to ourselves, not point the finger all the time. political theorist. Born 1906, died 1975. More information about Hannah Arendt.